Crystal Cove State Beach There's no lack of lovely beaches along the Southern California Coast, but I'm particularly fond of this secluded state beach, dotted with historic beach cabins (available for rental). 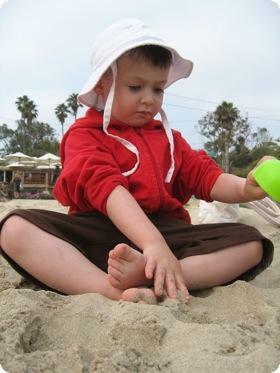 To read more, check out: Crystal Cove State Beach - an Antidote to Disneyland? Irvine Regional Park This sweet park is one of my kids favorite activities when we're in the area. Peacocks wander freely through the huge park and the grounds are tree fill and shaded, but the real gem as far as my kids are concerned are the pony rides and model train ride. A limited selection of snacks are available, but you may want to bring your own lunch. The Zoo Two regional zoos make nice outings for kids who love animals. The Orange County Zoo, located inside Irvine Regional Park is focused on local animals and plants. Closer to Disneyland, the Santa Ana Zoo features the plants and animals of Central and South America. The primate collection is extensive and features a baby crested capuchin monkey (this endangered species is incredibly rare outside of native Brazil). There is also a train ride, a small barnyard, and an aviary. Laguna Beach Laguna beach is big, crowded, and wonderful. The kids will enjoy exploring the tide-pools that are available almost year-round (arrive early in the day) and you can even pick up a game of Basketball or Volleyball. Cross the street, and you'll find a walkable small town filled with locally owned restaurants, art galleries and shops. Pacific Marine Mammal Center This non-profit center rescues and rehabilitates marine mammals found along the Orange County Coast. This is a working hospital, and while this is a wonderful way to learn more about these magnificent creatures you should expect to see animals that are injured or sick during your visit. Bristol Farms This upscale grocery store makes whole foods look ... a little uninspired. It's the perfect place to pick up a picnic lunch before heading to the beach. Newport Fashion Island This upscale shopping center has a little something for everyone. Even young toddlers will enjoy the "Pop-Jet" fountain where drops of water shoot up from the ground and kids try to run through without getting wet (they will fail, of course, so bring along an extra set of clothes). There's also a dramatic fountain with choreographed music, a carousel and a Koi Pond nestled in amongst stores like Baby Style, Pottery Barn Kids, and Hanna Andersson. Food options here are mainly chains, and among these, our favorites are Wahoo's Fish Tacos, Pinkberry, and California Pizza Kitchen. Little Saigon Westminster Driving through Little Saigon is almost like taking a trip to Southeast Asia. Even the street signs change, and the four block area is filled with grocery stores, restaurants, bakeries and shops. A popular and easy stop is the Asian Garden Mall where ethnic clothing and other botiques, toys, bakeries, and the largest gold jewelry mart in the US, are all available for easy browsing. There's even a small food court. If you aren't familiar with the food of this region, a walk through 99 Ranch Market is an interesting journey. Follow it up with lunch at one of the nearby restaurants and some excellent pastry from any of the bakeries. Another favorite stop is Lee Sandwiches where vietnamese sandwiches are made to order on fresh baked bread (note that this isn't a great place for picky eaters), but it is fast and delicious. Long Beach Aquarium of the Pacific, focuses on animals found in the pacific ocean. There is a new exhibition of venomous creatures and you'll even get the chance to touch a shark! There's also a small aviary. Kidseum at the Bowers Museum: The Bowers museum focuses arts from around the world as a way of learning more about other cultures. The Kidseum, housed in a separate building from the main museum gets kids in on the action with international dress-up clothes, tribal instruments, ethic masks and some creative ways to explore different languages.